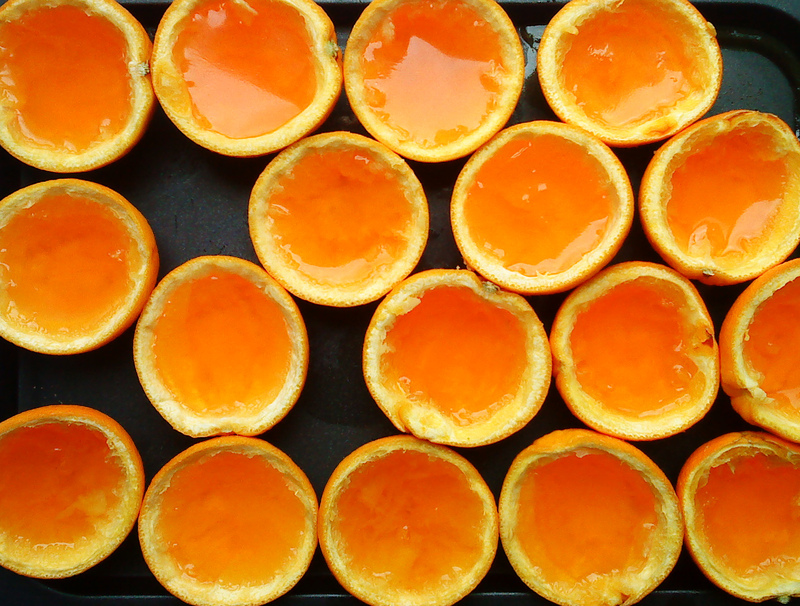 I usually make lime vodka jelly or lemon, I tend to go citrus over the sweetness of a berry jelly. 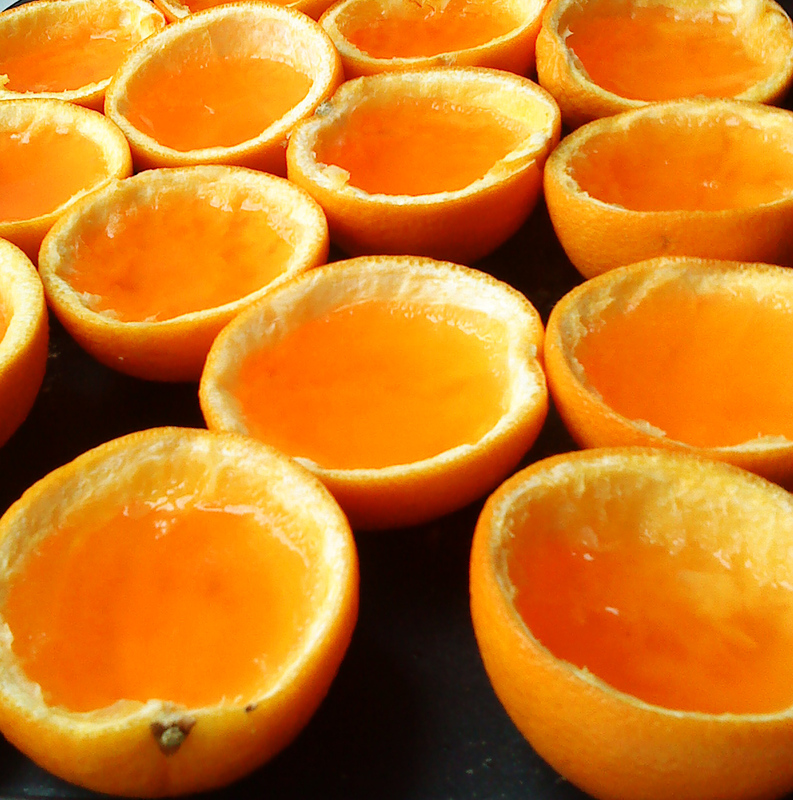 Anyway, this time I decided to go for orange and thought how cute would it be to serve them in oranges. So that’s exactly what I did. We, yes I had lovely willing help from himself, halved and scooped out the insides of a bag of oranges and filled them with the vodka jelly mixture, I think I used a third absolut to two-thirds water, or maybe it was half n half! The original plan was to serve them in quarters like boats but time escaped me and so i served them in halves with little spoon, and there were no complaints! When I bake bread I always make brown bread, probably because that’s what my lovely mother always makes so I decided I’d try some lovely soda bread from Rachel Allen‘s ‘Bake’. I looked up a few recipes and the only main difference I came across was some put the bread in a hot hot oven first and then reduce the heat after five minutes. It’s a very simple bread to make; you sieve together the dry ingrediants, make a well and gradually add in the milk with your hand in the shape of a claw. There is no need to knead (hee hee!) this bread. You remove it from the bowl and gently shape on a floured service. Make a cross on it with a sharp knife and place in a preheated oven 200 degrees celcius and back for 30 minutes. We enjoyed this for our breakfast with some blueberry jam. Great start to the day! When someone is calling over for dinner mid-week, I usually go for hassle free and tasty! The weeks seem to jam-packed lately and are flying by, so it’s always nice to sit down over a meal and catch up with friends. I love this prawn dish and I make a few variations of it including a chili/ tomato version. It’s so so simple and very quick to prepare. I made it whilst chatting to the lovely Ciars Lite! You first put the pasta on to cook. Heat some oil and butter in a pan and when hot fry a few cloves of mashed garlic. When they have coloured slightly you add the prawns, leave them for a minute and add about a glass or more of wine, depending on how many you are cooking for. Let this simmer to boil off the alcohol. Bring the heat down and gradually stir in some cream, let this simmer and thicken. If you like a thick sauce (I don’t) you can add some corn flour. To do this I generally remove a tbsp or two of the sauce from the pan into a cup, mix in the flour and then return it to the pan and stir it in. When the spaghetti is cooked toss it into the prawns and sauce. I love this served with fresh lemon squeezed over it and sprinkling of grated Parmesan! I came across the recipe for Pumpkin Whoopie pies on one of the blogs I follow; they sounded deliciously warm and autumnal and I thought to myself I’d love to try those!The smell in the kitchen from all the lovely spices was heavenly and reminiscent of Christmas. The recipe, funnily enough called for 3 cups of pumpkin puree; now I’m not a fan of pumpkin so I substituted it with a homemade apple puree ( I used about 5 cooking apples). They’re very easy to make; you mix together the dry ingredients, then you mix the wet together and gradually add in the dry. You place heaped dessert spoon full of the mixture on a lined baking sheet and bake at 180 degrees celsius for approx 15 minutes. Allow to cool completely in the tin. The required filling was one made with cream cheese. I’m also not a fan of cream cheese in desserts, in fact, truth be told, I despise cream cheese in desserts. I only like cheesecake when made with cottage cheese and lemon jelly. It’s one of my few baking peeves! So instead of the filling I used the vanilla filling from the oreo cookies. You beat equal quantities of butter and vegetable fat with one two tsp of vanilla and then gradually add icing sugar until light and fluffy. Fill a piping bag with the mixture and pipe onto one of the cookies and sandwich with another of the same shape. Be carefull not to put too much filling though, unless of course, you like it that way! 1 Tbsp. ground cloves *I found the cloves to be a little over powering and would use less when making again. 3 cups pumpkin puree, chilled *I used fresh homemade apple puree. 1) Preheat oven to 350 degrees. Line baking sheets with parchment paper or a nonstick baking mat; set aside. 2) In a large bowl, whisk together flour, salt, baking powder, baking soda, cinnamon, ginger, and cloves; set aside. In another bowl, whisk together brown sugar and oil until well combined. Add pumpkin puree and whisk until combined. Add eggs and vanilla and whisk until well combined. Sprinkle flour mixture over pumpkin mixture and whisk until fully incorporated. 3) Using a small ice cream scoop with a release mechanism, drop heaping tablespoons of dough onto prepared baking sheets, about 1-inch apart. Transfer to oven and bake until cookies are just starting to crack on top and toothpick inserted into the center of cookie comes out clean, about 15 minutes. Let cool completely on pan. 1) Sift confectioners’ sugar into a medium bowl; set aside. In the bowl of an electric mixer fitted with the paddle attachment, beat butter until smooth. Add cream cheese and beat until well combined. 2) Add confectioners’ sugar and vanilla, beat just until smooth. 3) Transfer filling to a pastry bag and pipe onto whoopie pie (turned over, the flat side facing up) and pipe almost to the edge; filling the surface area. Place second whoopie pie (flat side facing down towards filling) and gently press until the filling spreads to the edge of the cookie. 4) Place cookies on baking sheet with parchment paper and cover with plastic wrap. Refrigerate cookies at least 30 minutes before serving.